Key West, FL. 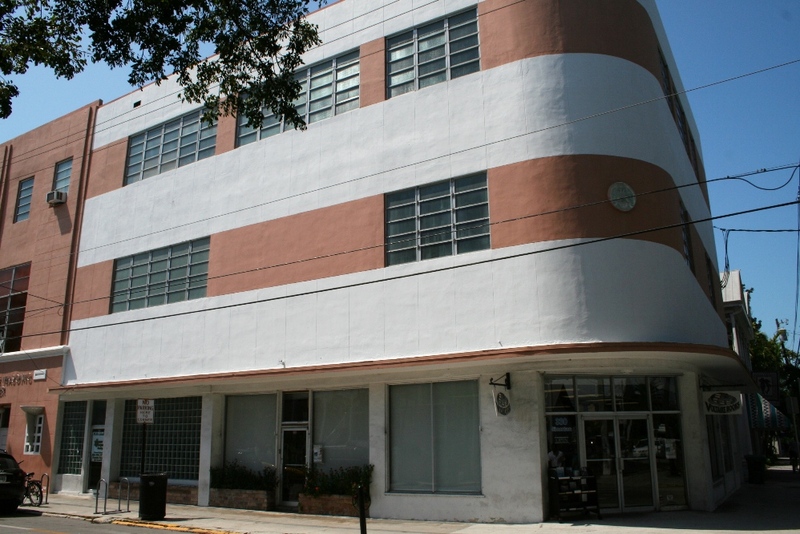 Smooth, veritical lines provide the art deco emphasis on this commercial building. 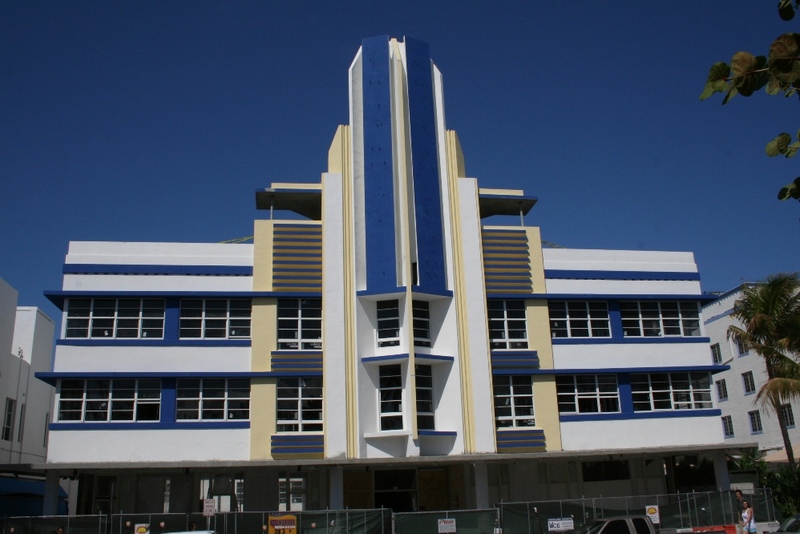 Identifying Art Deco: Smooth wall surface, often stucco; smooth-faced stone and metal; polychromy, often with vivid colors; forms simplified and streamlined; geometric designs including zigzags, chevrons; towers and other vertical projections, presenting a vertical emphasis; machined and often metalic construction materials for decorative features. Identifying Art Moderne: Smooth, rounded wall surfaces, often stucco; flat roof with small ledge at roofline; horizontal grooves or lines in walls (sometimes fluted or pressed metal); asymmetrical façade; casement, corner, or ribbon windows arranged horizontally; metal balustrades; glass-block windows, often curved and built into the curved wall. Unlike Art Deco, an emphasis on the horizontal. 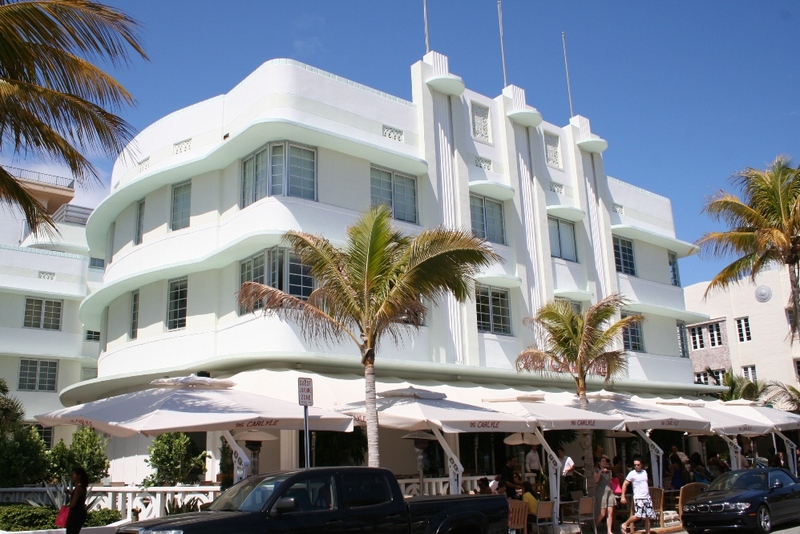 BACKGROUND AND INSPIRATION: Art Deco was the first widely popular style in U.S. to break with revivalist tradition represented by Beaux-Arts and period houses. 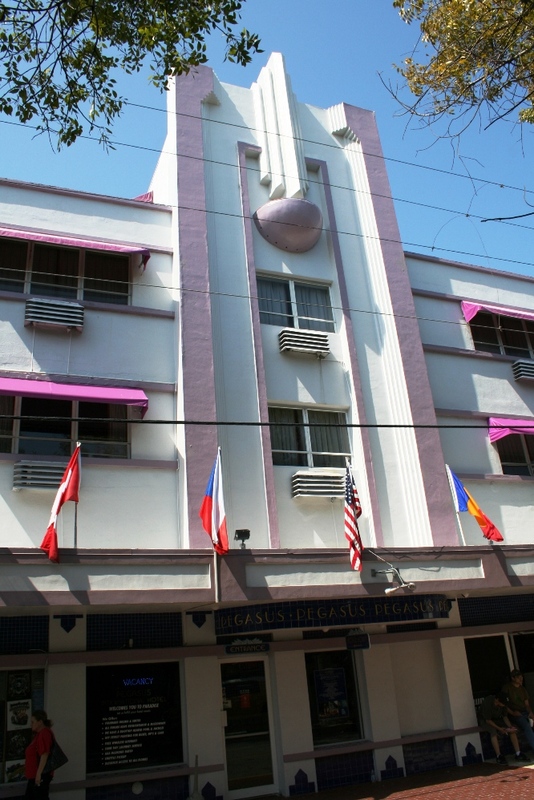 Art Deco uses a style of decoration that was applied to jewelry, clothing, furniture, handicrafts, and – in this case – buildings. Industrial designers used art deco motifs to decorate streamlined cars, trains, kitchen appliances, and many other machine-age innovations. Art Deco takes its name from the Exposition Internationale des Arts Decoratifs and Industriels Modernes, held in Paris 1925. This event was billed as a showcase for works of “new inspiration and real originality”. The style strove for a modern and artistic expression to complement the machine age. An emphasis on the future rather than the past was the style’s principal characteristic. 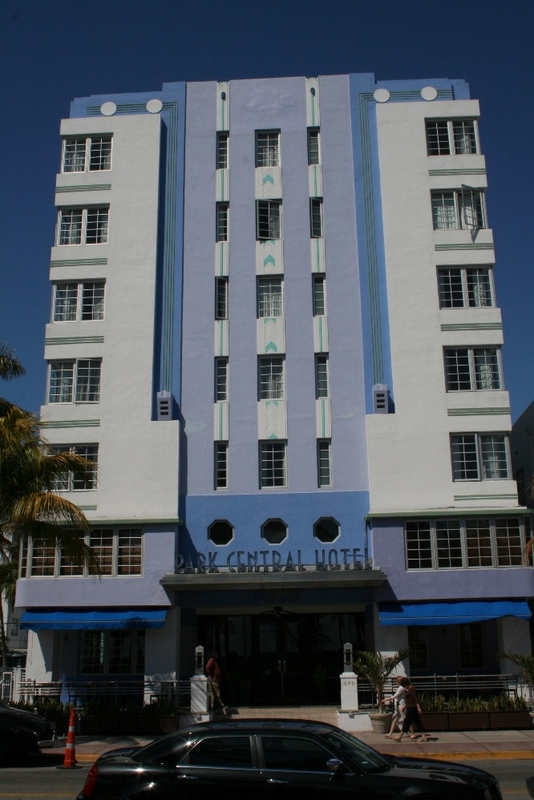 Both Art Deco and its cousin, Art Moderne, were rarely used for houses; they were more common for commercial buildings and skyscrapers, and occasional institutional buildings. The styles were most popular in New York City and other large metropolitan areas that continued to grow during the 1930s and 40s. 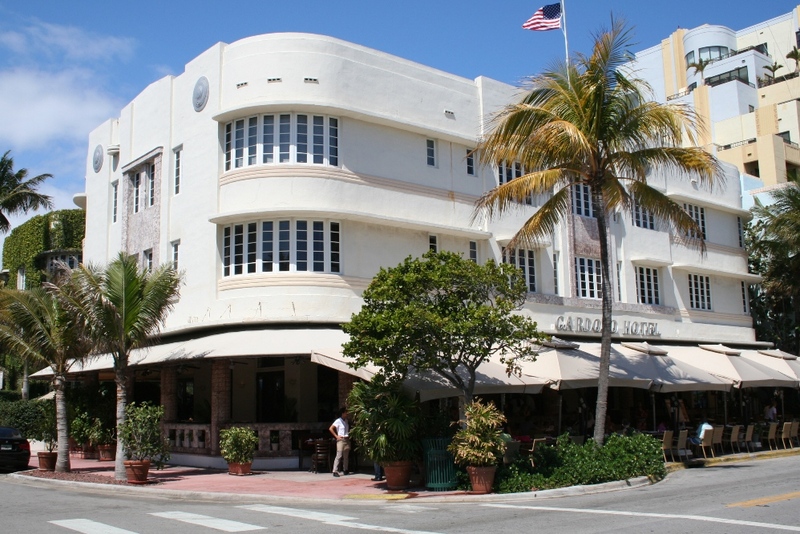 Though relatively rare compared to other more popular styles, both Art Deco and Art Moderne spread widely throughout the country into large city and small town alike. Los Angeles, CA. 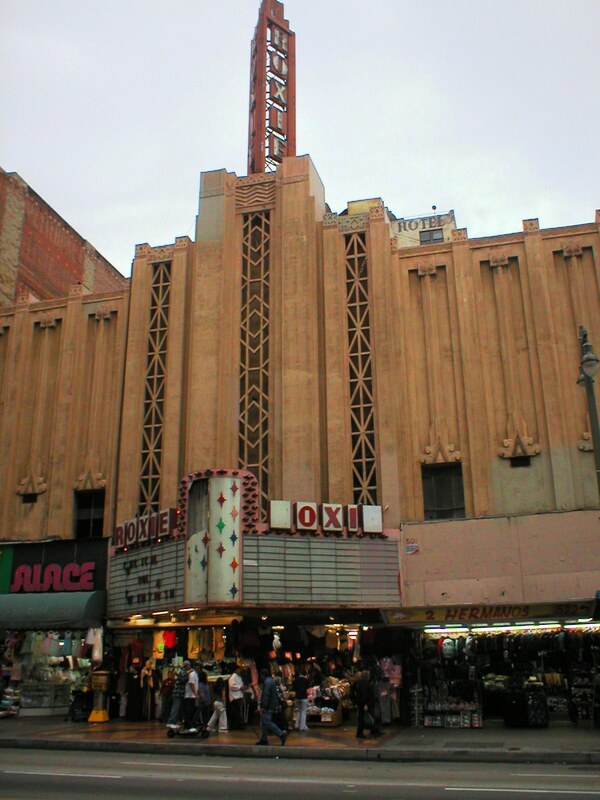 The old Roxie Theatre on Broadway St. Art deco facades were popular for the modern-age picture theatres of the 1920s and 30s. Boston, MA. An art deco office tower, lower floors pictured here. The vertical sleekness of the style was especially suitable for the second generation of America's skyscrapers after the 1920s. Miami Beach, FL. An impressive art deco central tower of vertical design. Miami Beach, FL. 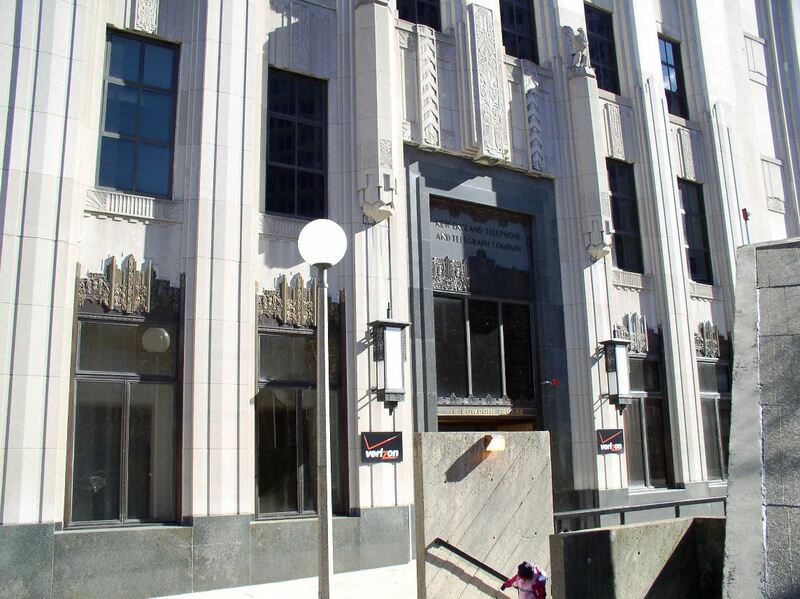 Primarily art deco with "port hole" windows over the entry and corner windows on upper floors. Miami Beach, FL. A combination of art deco and moderne styling provides for both veritcal and horizontal emphases. Miami Beach, FL. Art moderne with streamlined, horizontal lines and curved ribbon windows. Venice Beach, CA. 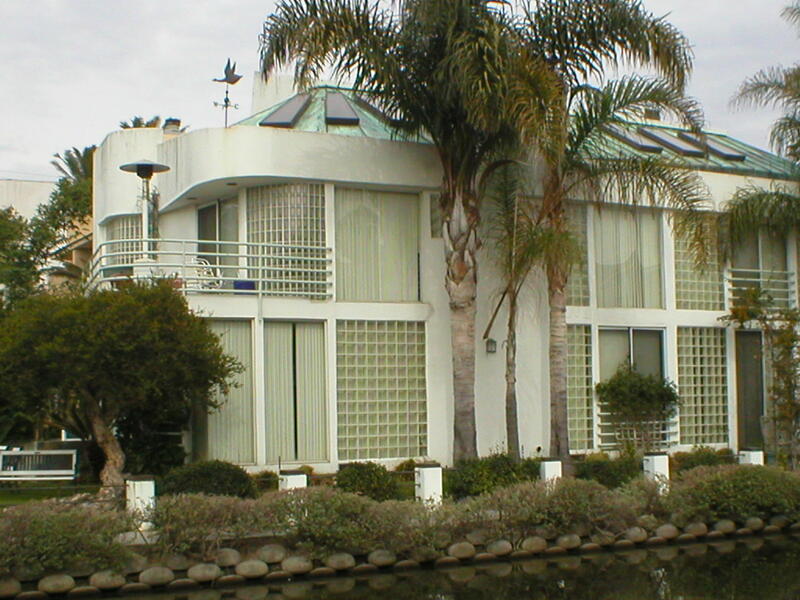 An art moderne home with metal balustrade, curved facade, and prolific use of glass brick. Key West, FL. A smooth, horizontal emphasis with ribbon windows and curved corner all indicate art moderne style.